An ultrasound is a non-invasive diagnostic tool that utilizes high frequency sound waves to create images used to identify or rule out potential health concerns. This study is a valuable tool in assessing pain or other symptoms, as well as show the size, shape and texture of many body parts that cannot be evaluated using conventional x-ray studies. It also is able to detect organ problems, such as gallstones, kidney stones or liver disease. 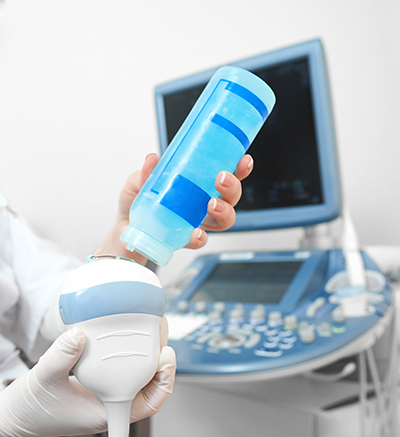 There is little preparation needed for most ultrasound procedures. Do not eat or drink ANYTHING for six hours prior to the exam for any abdominal ultrasound involving the aorta, gallbladder, liver, pancreas, or kidneys. This will ensure the highest quality images. Drink 8-10 glasses of water one to two hours prior to the exam for a pelvic ultrasound. Do not urinate during this time as an uncomfortably full bladder is required for the exam. Check with your healthcare provider about taking your medications. Often medications are permitted with a small sip of water. The technologist will spread a water-based gel on the area to be examined that enhances sound waves. An instrument called a transducer will be placed on the part of the body to be examined. Adult Ultrasound is performed in the following PPC offices.